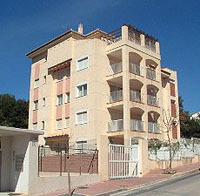 Elegance and exclusivity are the keynotes of this fine second floor apartment, one of just 13 in a small, secure, four storey block set in a quiet location just off the seafront, south of the Arenal beach in Javea. The finish of the apartment itself, and the interior furnishings and decoration, are of the highest quality, making it the perfect holiday home from home for the discerning visitor. From the living room and terrace there are sea glimpses, as there is a rocky sea frontage only 50 metres from the apartments, with steps set into the rock to give easy access for snorkelling and scuba diving. Also within a few minutes walking distance of the apartment is the picturesque rocky cove, La Caleta, and an excellent beach bar and restaurant (open April to October). The distance to the Arenal sandy beach is 700 metres and the Port and historic old town are about 3 km away. There are two supermarkets within walking distance, and several golf courses are within a 25-minute radius. Master bedroom: double bed with en suite shower room. 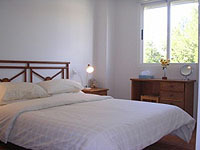 2 twin bedded rooms Bathrooms	En suite: de luxe multifunction walk-in shower with wc, bidet & basin. Family bathroom: bath with shower, wc, bidet & basins. Heated radiator in each. Living room	2 sofas. Dining table/chairs. 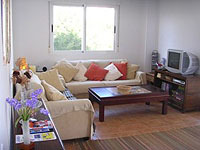 TV with good choice of English channels inc BBC, ITV, Ch 4 & 5, sports, films. DVD + selection of DVDs. Double glass doors to large terrace overlooking pool & lawns, with dining table & chairs, including 2 recliners. Sea glimpses. Kitchen	Sink, ceramic hob, electric oven, fridge/freezer, microwave. 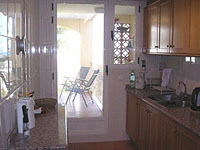 Glazed door leads to covered utility area with sink and washing machine, and then onto the terrace. 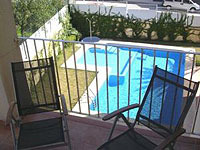 Outside & General	Private gardens, lawns and pool. Lift. Air conditioning. Warm air heating. 2 garden chairs & sun umbrella. Secure underground parking. Barbecue. Services/Linen	Property cleaned between lets. Fresh bed linen supplied weekly. Hand/bath towels provided (not swimming towels). Airport pick-up service available.